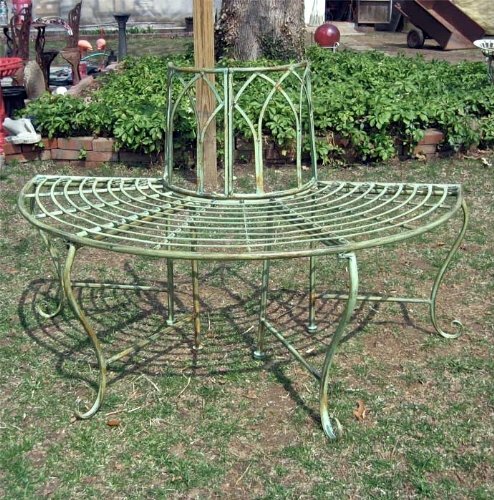 1/2 Round Tree Bench/Plant Stand constructed of Wrought Iron in an Antique Mint Green Finish. The Bench measures as follows: 47" straight across the Back 15" Wide Bench Front to Back 14 1/2 " Curved Arch, back of Bench seat 17 1/2 "High from base of Bench leg to Bench seat 30" High from base of bench leg to top back of curved Arch Very Nice detail. Assembly Required. If you have any questions about this product by SERENDIPPITY, contact us by completing and submitting the form below. If you are looking for a specif part number, please include it with your message.